Schumaker Landing is a 48-unit high end townhome community which offers 2 and 3 bedroom units with a garage and private patio. Was built in 2-phases; 2009 and 2013. Current NOI is approximately $500,000. Additional financial information can be provided upon request. Townhome Amenities Include: Private Patio, Garage, Washer/Dryer, Dishwasher, Garbage Disposal, Refrigerator, Range, Over the Range Microwave, Hardwood/Carpet Floors, High Speed Internet Available, 24 hour Video Security Monitoring Cameras. Schumaker Landing is conveniently located in the heart of Salisbury, MD. Neighboring attractions include the park, pond, zoo and walking trails, as well as a daycare center, the Ward Musuem of Wildfowl Art, YMCA, shopping and more! *The adjoining 7.69 acre lot can be purchased for expansion. OPPORTUNITY ZONE! 144,492 sq.ft. manufacturing facility for sale at $4,500,000 or lease at $4.00 per sq.ft. 20' - 27' ceiling heights. 2 overhead cranes with 2 - 5 ton hoists w/ remote control / 4 electric 3 ton hoists, 8 - 2.5 ton hoists on JIB cranes. 3 phase electric 600V 2000 amps. Security fencing. 20 +/- acres. Drive-in doors and warehouse loading doors. 265+ parking spaces. 1800 sq.ft. office space. Large employee lounge. Add'l 15,000 sq.ft. warehouse with 5 - 20' drive-in doors. The sale is subject to existing leases. 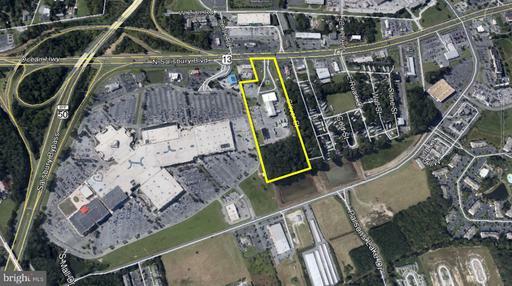 Opportunity Zone - 35.86 acres of retail development land in highly desirable Rt. 13 north corridor. Traffic count of 42,000 daily. Direct Rt. 13 access with add'l access from side street. Price is $120,000 per acre. Located near the Centre at Salisbury, Target, Lowes, Home Depot, Sam's Club, McDonalds, Barnes & Noble and many other retails. Adjoining 5.17 acres, offering 250' frontage on Rt. 13, available. OPPORTUNITY ZONE! Totally renovated & updated manufacturing warehouse w/office in the Northwood Industrial Park. 49,227 sq.ft. with 14,490 sq.ft. office. 32,500 sq.ft. warehouse/manufacturing space with 18' ceiling heights. 5 dock doors w/levelers and 1 14' drive-in door. Add'l chemical building and metal storage building. Entire facility is heated and cooled. Also available for lease $7 per sq.ft for office and $3.50 per sq.ft. for warehouse.Building layout is flexible and office space could be converted to manufacturing space if needed. 200,000 sq.ft. Manufacturing facility for sale on 16 acres with 2.8 acres of paved parking. Owner will consider a sale/leaseback for a portion of the facility. Plenty of space for tractor trailers and long term parking. High visibility land on Snow Hill Road adjacent to Marley Manor Apartments. 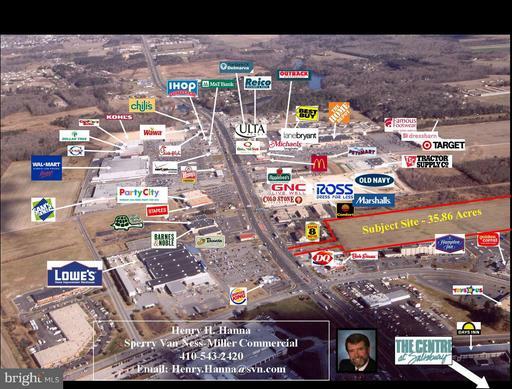 17.54 acres commercially zoned acres. Owner will subdivide. Concept site plan in this listing is for discussion and has not been formally approved. Regional stormwater and city utilities available. $99,000 per acre. One of a kind exquisite home on a 3.38 acre lot overlooking the Wicomico River, this stately residence offers everything imaginable for the homeowner looking for the absolute best of the best. The home showcases the care and attention given to every detail, inside and out, to create a residence that is truly unique and remarkable in design and craftsmanship offering 15 rooms + 7.5 baths. This home features many amenities such as an elevator, third floor master suite,professionally landscaped and hard-scaped, to many amenities to list! This is an absolute must see to appreciate!